This is not my original idea but it is a powerful way to review the blogging process! The following resources introduced me to paper blogging. 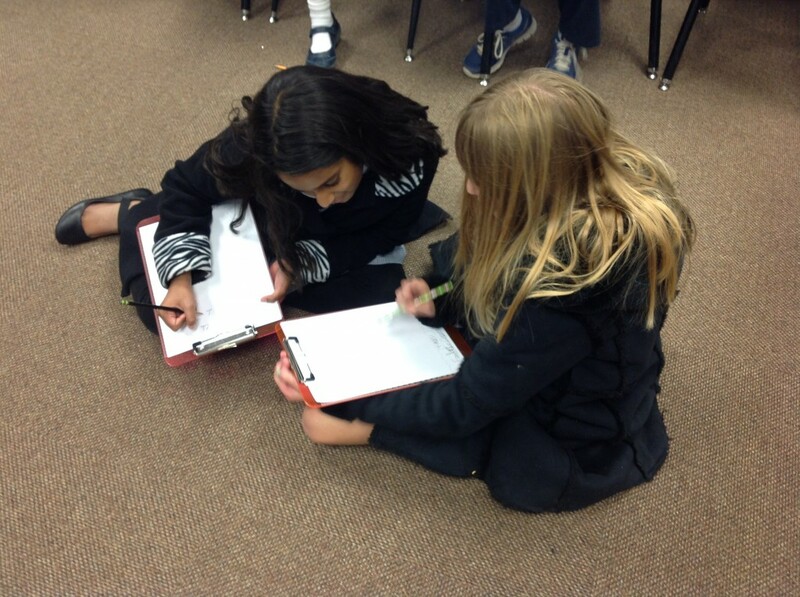 What always amazes me is how involved the students become with paper blogging! Not one person asks about getting on the computers! Our students have blogged since first grade but I always like to include this activity – just to make sure students refocus on the intent of our blogs: To share their learning in a positive and meaningful way. 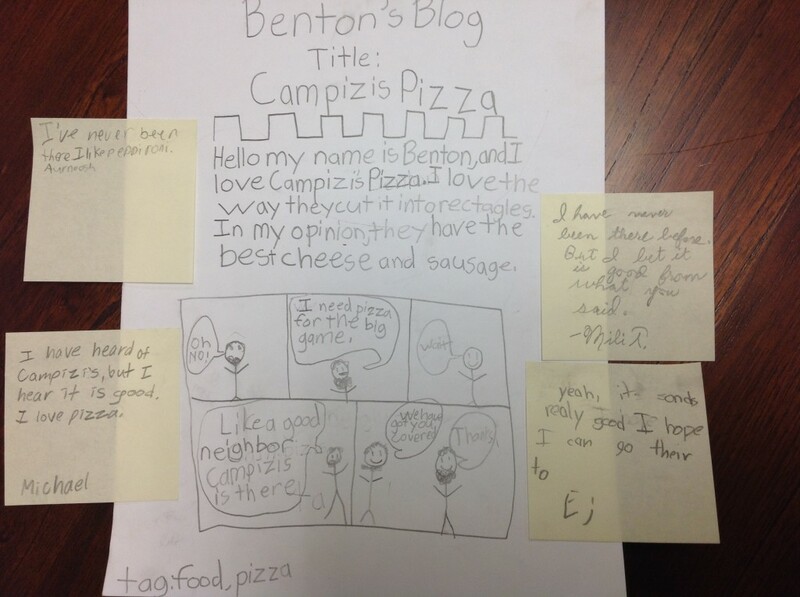 Taking the food idea from Leonard Low’s Workshop Activity: Paper Blogs, I asked students to raise their hand if they liked to eat. Of course, that brought an enthusiastic response! I told them that they would be writing a blog post on paper and the following day would be spent writing comments using sticky notes. The instructions were to write about a favorite food – it could be from a restaurant or something made by parents, relatives, or anyone else. They needed to write something that would paint a picture for the reader – use details! Pictures always spruce up a post so illustrations were strongly encouraged. Tags – This was a good review for students. What is your post about? Everyone could add “food” as a tag. As you write, you’ll think of other tags to add that would help readers find all posts about specific subjects . . . Title – every post needs a title! 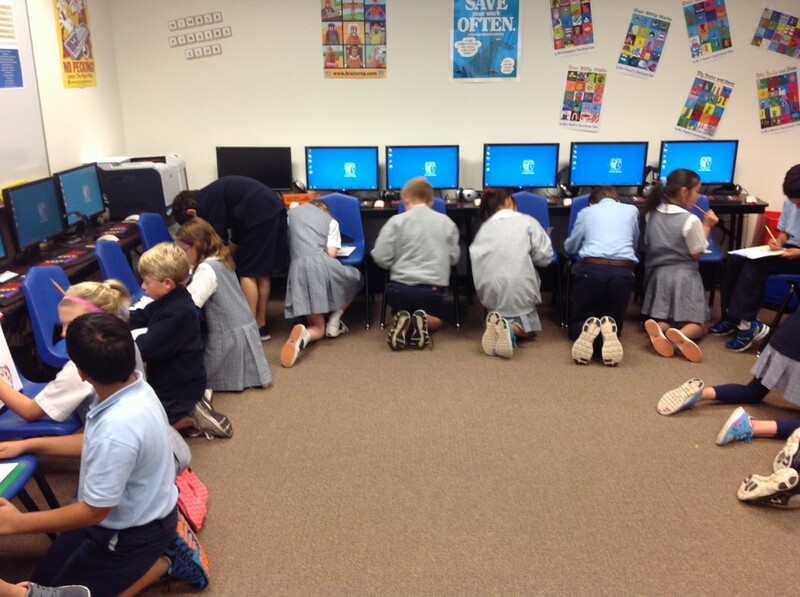 Then the students scattered in the small room to find a space to write. At first there were murmurings about their topic and how delicious their chosen food was (and how hungry they were becoming just thinking about it . . .), but soon all you could hear were pencils and pens scratching across the paper. The next day, students came in to find four sticky notes on top of their post. We discussed penny comments versus dollar (and up) comments. There were some puzzled looks when I mentioned a penny comment but I asked how much they could buy with a penny. “Nothing” was the general consensus. We compared that to a “nothing” comment – a word or two that didn’t add anything to the conversation. But a dollar comment would include details, ask questions, make connections. Of course, the competitive nature of children meant that each wanted to beat a dollar comment – $5, $10, and up were certainly better than just $1! I had the students stand at their seats with a pencil in hand. Instructions were to read the post and write a comment, including their first name. I had them count four chairs clockwise. At that point they stopped, read the post and wrote a comment. When finished we repeated the process. This time they could comment on the blog OR respond to the comment. We did this a total of four times, going clockwise or counter-clockwise (just to keep everyone guessing!). Dollar comments – Lots of hands went up to share. We really had some strong, quality comments – possibly because the children wanted to impress each other. I had one student who, shall we say, is not always into the lessons. He surprised me by writing some amazing comments and was always the one we were waiting on to finish the comments! When we debriefed, his name came up several times when we shared the dollar comments. I can’t wait to read their online blogs! « Celebrating Picture Book Month!